The company is the major salvor in the St. Mary's River system at Sault Ste. Marie and has on station sufficient salvage Tugs & Equipment to handle almost any salvage work. The company is always ready to carry out particular marine oriented construction and is constantly being employed in making the necessary major repairs to its customers marine facilities. We have an extensive fleet of crane barges for dredging in Canadian waters. View more information & pictures about these services. 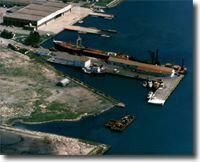 The companies main dock at Sault Ste. Marie Ontario can accommodate vessels with a draft of 6.1 meters. The full face dock is 100 meters long and has an approach pier to accommodate the loading and offloading of smaller vessels. The dock employees are trained and capable of providing tug and stevedoring services to our customers at reasonable rates. The Sault Ste. Marie dock has a permanent, experienced crew of men trained in stevedoring. This crew is available to our customers at any time and anywhere in the port of Sault Ste. Marie.